Hi, I had a bicycle crash last week when I sustained multiple fractures of the cheekbones and lost a few teeth. All seems to be healing well one week on but I'm wondering how this could affect ear clearing and risk of embolism in the face on ascent i.e. should I just give up the week's diving trip I've already paid for 8 weeks after the accident and if so, what about future diving? I didn't have an operation, just broken teeth removed but have been told I can't get work done on them until face bones are healed and that could be 1-2 months. I can give more medical details if necessary, I'm wondering really if there's likely to be a mandatory 3 month exclusion or similar. There is the potential here for gas to have entered the facial tissues, or for abnormal conduits to have been made between the usual gas-containing spaces in the head (sinuses, ears). Gas in the tissues is referred to as "subcutaneous emphysema". 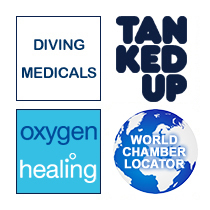 The classic diving-related manifestation is when the lung tears on a rapid or breath-holding ascent, with consequent leaking of the air into the tissues. I can remember the first patient I saw with this – the crackling sensation when I felt his neck was just like popping bubble wrap. Although the commonest symptoms are breathlessness and chest pain, sometimes the only one is a high-pitched or unusually nasal voice, as the free gas reaches the larynx and distorts the vocal cords. Happily the gas is reabsorbed fairly quickly so the treatment is simply supportive – oxygen and bed rest will usually do the trick, but obviously the cause of the escaped gas needs to be corrected (often more difficult). In your case, the question is whether there is any gas trapping. Hopefully the X rays and imaging you had would have revealed any abnormalities, but it’s difficult to exclude small pockets of gas in the tooth sockets with such tests. But following the same principles, gas will normally dissipate within days, and if the repair work is going to be delayed then it shouldn’t be an issue. I'd suggest you get a check up with a diving doc nearer the time to make sure, but I don't see any need for a compulsory 3 month lay off. Take care when you next mount your 2 wheeled steed.